Indian Railways (IR) is India's national railway system operated by the Ministry of Railways. It manages the fourth largest railway network in the world by size, with 67,368-kilometre (41,861 mi) route.. Routes are electrified with 25 kV AC electric traction while thirty three percent of them are double or multi-tracked. As of March 2017, IR's rolling stock consisted of 277,987 freight wagons, 70,937 passenger coaches and 11,452 locomotives. IR owns locomotive and coach-production facilities at several locations in India. The world's eighth-largest employer, it had 1.308 million employees as of March 2017. In the year ending March 2018, IR carried 8.26 billion passengers and transported 1.16 billion tonnes of freight. In the fiscal year 2017–18, IR is projected to have revenue of ₹1.874 trillion (US$26 billion), consisting of ₹1.175 trillion (US$16 billion) in freight revenue and ₹501.25 billion (US$7.0 billion) in passenger revenue, with an operating ratio of 96.0 percent. The first railway proposals for India were made in Madras in 1832. The country's first train, Red Hill Railway (built by Arthur Cotton to transport granite for road-building), ran from Red Hills to the Chintadripet bridge in Madras in 1837. In 1845, the Godavari Dam Construction Railway was built by Cotton at Dowleswaram in Rajahmundry, to supply stone for the construction of a dam over the Godavari River. In 1851, the Solani Aqueduct Railway was built by Proby Cautley in Roorkee to transport construction materials for an aqueduct over the Solani River. India's first passenger train, hauled by three steam locomotives (Sahib, Sindh and Sultan), ran for 34 kilometres (21 mi) with 400 people in 14 carriages on 1,676 mm (5 ft 6 in) broad gauge track between Bori Bunder (Mumbai) and Thane on 16 April 1853. The Thane viaducts, India's first railway bridges, were built over the Thane creek when the Mumbai-Thane line was extended to Kalyan in May 1854. Eastern India's first passenger train ran 24 miles (39 km) from Howrah, near Kolkata, to Hoogly on 15 August 1854. The first passenger train in South India ran 60 miles (97 km) from Royapuram- Veyasarapady (Madras) to Wallajah Road (Arcot) on 1 July 1856. On 24 February 1873, a horse-drawn 3.8-kilometre (2.4 mi) tram opened in Calcutta between Sealdah and Armenian Ghat Street. On 9 May 1874, a horse-drawn tramway began operation in Bombay between Colaba and Parel. In 1897, lighting in passenger coaches was introduced by many railway companies. On 3 February 1925, the first electric passenger train in India ran between Victoria Terminus and Kurla. The organisation of Indian railways into regional zones began in 1951, when the Southern (14 April 1951), Central (5 November 1951) and Western (5 November 1951) zones were created. Fans and lights were mandated for all compartments in all passenger classes in 1951, and sleeping accommodations were introduced in coaches. In 1956, the first fully air-conditioned train was introduced between Howrah and Delhi. Ten years later, the first containerized freight service began between Mumbai and Ahmedabad. In 1986, computerized ticketing and reservations were introduced in New Delhi. In 1988, the first Shatabdi Express was introduced between New Delhi and Jhansi; it was later extended to Bhopal. Two years later, the first self-printing ticket machine (SPTM) was introduced in New Delhi. In 1993, air-conditioned three-tier coaches and a sleeper class (separate from second class) were introduced on IR. The CONCERT system of computerized reservations was deployed in New Delhi, Mumbai and Chennai in September 1996. In 1998, coupon validating machines (CVMs) were introduced at Mumbai Chhatrapati Shivaji Maharaj Terminus. The nationwide Concierge system began operation on 18 April 1999. In February 2000, the Indian Railways website went online. On 3 August 2002, IR began online train reservations and ticketing. Indian Railways announced on 31 March 2017 that the country's entire rail network would be electrified by 2022. Indian Railways is headed by a seven-member Railway Board whose chairman reports to the Ministry of Railways. Railway Board also acts as the Ministry of Railways. The officers manning the office of Railway Board are mostly from organised Group A Railway Services and Railway Board Secretariat Service. IR is divided into 18 zones, headed by general managers who report to the Railway Board. The zones are further subdivided into 68 operating divisions, headed by divisional railway managers (DRM). The divisional officers of the engineering, mechanical, electrical, signal and telecommunication, stores, accounts, personnel, operating, commercial, security and safety branches report to their respective DRMs and are tasked with the operation and maintenance of assets. Station masters control individual stations and train movements through their stations' territory. In addition, there are a number of production units, training establishments, public sector enterprises and other offices working under the control of the Railway Board. Staff are classified into gazetted (Groups A and B) and non-gazetted (Groups C and D) employees. Gazetted employees carry out executive / managerial / officer level tasks. As of March 2017, the number of personnel (Groups A & B) constitutes 1.2% of the total strength, while Group C & D account for 92.6% and 6.2% respectively. The training of all groups is shared among seven centralized zonal training institutes and 295 training centers located all over India. IR offers housing and runs its own hospitals, schools and sports facilities for the welfare of its staff. India uses electric and diesel locomotives, along with a few CNG (compressed natural gas) locomotives. Steam locomotives are no longer in use, except in heritage trains. Locomotives in India are classified by gauge, motive power, the work they are suited for and their power or model number. Their four- or five-letter class name includes this information. The first letter denotes the track gauge; the second their motive power (diesel or electric), and the third their suitable traffic (goods, passenger, multi or shunting). The fourth letter denotes a locomotive's chronological model number. In 2002, a new classification was adopted in which the fourth letter indicates a newer diesel locomotive's horsepower range. A locomotive may have a fifth letter in its name, denoting a technical variant, subclass or subtype (a variation in the basic model (or series) or a different motor or manufacturer). In the new diesel-locomotive classification, the fifth letter refines the horsepower in 100-hp increments: A for 100 hp, B for 200 hp, C for 300 hp an so on. In this classification, a WDM-3A is a 3100 hp, a WDM-3D a 3400 hp and a WDM-3F a 3600 hp locomotive. [a] Diesel locomotives are fitted with auxiliary power units, which save almost 88 percent of fuel during idle time when a train is not running. As of March 2017, IR fleet consisted of 277,987 goods wagons. They carried 1,110 million tonnes of freight in Fiscal Year 2016–17. Wagon types used by IR include BCACBM, BCCN, BCNA, BCNHL, BOBRN, BOBYN, BOXN (BOXN-HL, BOXN-HS, BOXN-HL, BOXN-CR, BOXN-LW, BOXN-AL, BOXN-EL), BRH, BTPGLN, BTPN and VVN. IR’s bulk requirement of wagons is met by wagon manufacturing units both in public and private sectors as well as other Public Sector Units under the administrative control of Ministry of Railways. On long distance routes and also on some shorter routes, IR uses 2 primary types of coach design types. ICF coaches, in production from 1955 until Jan 2018, constitute the bulk of the current stock. These coaches, considered to be having inadequate safety features, are slowly being phased out. As of September 2017, around 40,000 coaches are still in operation. The older coaches are being replaced with LHB coaches. Introduced in mid '90s, these coaches are lighter, safer and are capable of speeds up to 160 kilometres per hour (99 mph). IR has announced that two new self-propelled train set designs will be introduced starting from mid 2018. These two train types, termed as Train-18 and Train-20, are expected to replace locomotive-hauled trains on long distance routes. On regional short distance routes, IR runs Mainline Electrical Multiple Unit (MEMU) or Diesel Electrical Multiple Unit (DEMU) trains, depending on the traction available. These train sets are self-propelled with capability for faster acceleration or deceleration and are expected to reduce congestion on dense routes. Passenger locomotive-hauled trains, having frequent stops are slowly being replaced with train sets across India. On suburban commuter routes around the large urban centers, IR runs trains with Electric Multiple Unit (EMU) coaches. As of March 2017, about 9100 coaches are in operation. Indian Railways is a vertically-integrated organization that produces majority of its locomotives & rolling stock at in-house production units, with a few recent exceptions. Chittaranjan Locomotive Works in Chittaranjan, West Bengal manufactures electric locomotives. Diesel Locomotive Works in Varanasi, Uttar Pradesh manufactures diesel & electric locomotives. Diesel Locomotive Factory in Marhowra, Bihar. It's a Joint Venture of Indian Railways & General Electric. It'll manufactures high horse power of diesel locomotive especially for freight transportation. Electric Locomotive Factory in Madhepura, Bihar. It's a Joint Venture of Indian Railways and Alstom SA. It is manufacturing powerful electric locomotives. The repair and maintenance of this vast fleet of rolling stock is carried out at 44 loco sheds, 212 carriage & wagon repair units and 45 periodic overhaul workshops located across various zones of IR. As of March 2017, IR network spans 121,407 km (75,439 mi) of track length, while the route length is 67,368 km (41,861 mi). Track sections are rated for speeds ranging from 80 to 200 km/h (50 to 124 mph), though the maximum speed attained by passenger trains is 180 km/h (110 mph). As of March 2017, most of the broad-gauge network is equipped with long-welded rails, pre-stressed concrete (PSC) sleepers and high tensile strength 52kg/60kg 90 UTS rails. 1,676 mm (5 ft 6 in) broad gauge, is the predominant gauge used by IR and spans 61,680 km (38,330 mi) of route (92% of total route network). It is the broadest gauge in use across the world for passenger movement. Broad gauge generated 100% of the freight output (Net tonne-Kilometres) and more than 99% of the passenger output (Passenger Kilometres) in the fiscal year 2016–17. The 1,000 mm (3 ft 3 3⁄8 in) metre gauge tracks; 762 mm (2 ft 6 in) and 610 mm (2 ft) narrow gauge tracks are present on fewer routes. All of these routes, except the heritage routes, are being converted to broad gauge. The metre gauge tracks were 3,479 kilometres (2,162 mi) (5% of total route network) and narrow gauges tracks were 2,208 km (1,372 mi) (3% of total route network) as of 31 March 2017. As of 31 March 2018, IR has electrified 49% or 33,057 km (20,541 mi) of the route kilometers and 46% or 55,240 km (34,320 mi) of the total running track. India uses 25 kV AC traction on all its electrified tracks. Total Route Kilometers Covered in the State as on 2018 (In Percentage). Railway electrification in India began with the first electric train, between Bombay Victoria Terminus and Kurla on the Harbour Line, on 3 February 1925 on the Great Indian Peninsula Railway (GIPR) at 1500 V DC. Heavy gradients in the Western Ghats necessitated the introduction of electric traction on the GIPR to Igatpuri on the North East line and Pune on the South East line. On 5 January 1928 1500 V DC traction was introduced on the suburban section of the Bombay, Baroda and Central India Railway between Colaba and Borivili, and between Madras Beach and Tambaram of the Madras and Southern Mahratta Railway on 11 May 1931, to meet growing traffic needs. The 3000 V DC electrification of the Howrah-Burdwan section of the Eastern Railway was completed in 1958. The first 3000 V DC EMU service began on the Howrah-Sheoraphuli section on 14 December 1957. Research and trials in Europe, particularly on French Railways (SNCF), indicated that 25 kV AC was an economical electrification system. Indian Railways decided in 1957 to adopt 25 kV AC as its standard, with SNCF their consultant in the early stages. The first 25 kV AC section was Raj Kharswan–Dongoaposi on the South Eastern Railway in 1960. The first 25 kV AC EMUs, for Kolkata suburban service, began service in September 1962. For continuity, the Howrah–Burdwan section of the Eastern Railway and the Madras Beach–Tambaram section of the Southern Railway were converted to 25 kV AC by 1968. Because of limitations in the DC traction system, a decision was made to convert to 25 kV AC in 1996–97. The conversion from DC to AC traction was completed in 2012 by the Western Railway, and in 2016 by the Central Railway. Since then, the entire electrified mainline rail network in India uses 25 kV AC, and DC traction is used only for metros and trams. Indian Railways announced on 31 March 2017 that the country's entire rail network would be electrified by 2022. Though not a nascent concept, the electrification in India now has been committed with a fresh investment of ₹35,000 crore (US$4.9 billion) to electrify the entire network and eliminating the cost of fuel under transportation which will amount to a massive savings of ₹10,500 crore (US$1.5 billion) overall. This will be a boon for savings for the Government to channelize the investments in modernization of the railway infrastructure. Close to 30 billion units of electricity will be required for railway electrification on an annual basis by 2022, leading to excellent opportunities for IPPs of conventional power. IR uses a range of signalling technologies and methods to manage its train operations based on traffic density and safety requirements. As of March 2017, around 2,850 km (1,770 mi) of the route uses automatic block signalling for train operations – concentrated in high density routes, large cities and junctions. Remaining routes are based on absolute block signalling with trains manually controlled by signal men from the signal boxes typically located at stations. Few low density routes still use manual block signalling methods with communication on track clearance based on physical exchange of tokens. In a few sections, intermediate block signalling is provided to further enhance line capacity with minimal investment. As of March 2017, 501 block sections have intermediate block signals on IR. IR primarily uses coloured signal lights, which replaced semaphores and disc-based signalling (dependent on position or colour). IR uses two-aspect, three-aspect and four (or multiple) aspect color signalling across its network. Signals at most stations are interlocked using panel interlocking, route-relay interlocking or electronic interlocking methods that eliminate scope for human signalling errors. IR uses track circuiting, and block proving axle counters for train detection. As of March 2017, 5584 stations across IR (about 90% of stations on broad gauge) have interlocked stations and multi-aspect signalling. Around 99% of key routes (A, B, C and D) have track circuitry or block proving axle counters for automated train detection. Also, IR has about 51,000 route kilometers of optical fiber cable network across India, that is used for train control, voice and data communication. Around 2,500 km (1,600 mi) of the route is covered by GSM-R based Mobile Train Radio Communication. In December 2017, IR announced that it will implement ETCS Level 2 system for signalling and control on key routes with an investment of ₹12,000 crore (US$1.7 billion). Currently IR uses Centralised Traffic Control (CTC) on the busy Ghaziabad – Kanpur route and real-time train monitoring systems on Mumbai and Kolkata suburban routes. Rail links between India and neighboring countries are not well developed. Two trains operate to Pakistan: the Samjhauta Express between Delhi and Lahore, and the Thar Express between Jodhpur and Karachi. Bangladesh is connected by the four times a week Maitree Express that runs from Kolkata to Dhaka and weekly Bandhan Express which began running commercial trips between Kolkata and Khulna in November 2017. Two rail links to Nepal exist: passenger service between Jainagar and Bijalpura and freight services between Raxaul and Birganj. Indian and Bangladeshi governments has started work on a new rail link to ease surface transport. India will build a 13 km (8.1 mi) railway linking Tripura's capital Agartala with Bangladesh's southeastern city of Akhaura, an important railway junction connected to Chittagong port, resource-rich Sylhet and Dhaka. An agreement to implement the railway project was signed between India's former Prime Minister Manmohan Singh and Bangladesh Premier Sheikh Hasina during her visit to India in January 2010. Total cost of the proposed project is estimated at ₹252 crore (US$35 million). The Indian Railway Construction Company (IRCON) is constructing the new railway tracks on both sides of the border. Of the 13 km (8.1 mi) rail line, 5 km (3.1 mi) of tracks fall in Indian territory. The Northeast Frontier Railways (NFR) is laying the connecting tracks for the new rail link on the Indian side, up to Tripura's southern-most border town, Sabroom – 135 km (84 mi) south of Agartala. From Sabroom, the Chittagong international sea port is 72 km (45 mi) away. No rail link exists with Myanmar but a railway line is to be built from Jiribam (in Manipur) to Tamu through Imphal and Moreh. The construction of this missing link, as per the feasibility study conducted by the Ministry of External Affairs through RITES Ltd, is estimated to cost ₹29.41 billion (US$410 million). An 18 km (11 mi) railway link with Bhutan is being constructed from Hashimara in West Bengal to Toribari in Bhutan. No rail link exists with either China or Sri Lanka. From December 2017, stations are categorised into the Non-Suburban Group NSG1 to NSG6, the Suburban Group SG1 to SG3, and the Halt Group HG1 to HG3 based on the earnings, passenger footfall and strategic importance. Before December 2017, stations were classified into A1, A, B, C, D, E and F categories, based only on the passenger earnings from the sales of platform tickets, thus limiting the ability of IR to better focus its investments in passenger amenities. IR has several classes of travel, with or without air-conditioning. A train may have one or several classes. Slow passenger trains have only unreserved seating, and the Rajdhani Express, Shatabdi Express, Garib Rath Express, Double Decker Express, Tejas Express, Humsafar Express , Duronto Express , Yuva Express and Vande Bharat Express have only air-conditioned classes. Fares for all classes differ, and unreserved seating is the least expensive. Fares for the Rajdhani, Duronto Shatabdi and Vande Bharat Express trains include food. In September 2016, IR introduced dynamic fares for the Rajdhani, Duronto and Shatabdi trains (except 1AC and EC classes) to increase revenue. Long-distance trains usually include a pantry car, and food is served at the berth or seat itself. Luxury trains (such as Palace on Wheels) have separate dining cars, but these trains cost as much as—or more than—a five-star hotel room. Saloon IR has started to operate saloon coaches to give hotel ambience on trains. These coaches operate on charter basis i.e. booking is required. These have a master bedroom, one normal bedroom, one kitchen and window trailing. Four to six extra beds are given to accommodate more people. First of these coach was attached to Jammu Mail. 1A AC first class: The most luxurious and expensive class of Indian Railways, with fares almost at par with airfares. There are eight cabins (including two coupes) in full AC first class coach and three cabins (including one coupe) in the half AC first class coach. The coach has an attendant, and bedding is included in the fare. This air-conditioned coach, present only on popular routes, can carry 18 (full coach) or 10 passengers (half coach). 2A AC two tier: These air-conditioned coaches have sleeping berths across eight bays. Berths are usually arranged in two tiers in bays of six: four across the width of the coach and two lengthwise across the corridor, with curtains along the corridor. Bedding is included in the fare. A coach can carry 48 (full coach) or 20 passengers (half coach). 3A AC three tier: Air-conditioned coaches with 64 sleeping berths. Berths are similar to 2A, but with three tiers across the width and two lengthwise for eight bays of eight. They are slightly less well-appointed, usually with no reading lights or curtains. Bedding is included in the fare. 3E AC three tier (economy): Air-conditioned coaches with sleeping berths on the Garib Rath Express. Berths are usually arranged as in 3A, but with three tiers across the width and three llengthwise. Appointments are similar to 3A, and bedding is not included. These coaches are also present in some Duronto Express trains as well. Vistadome IR operates Vistadome glass roof coaches on some tourist routes. These include Araku Valley, Konkan railway, Kalka-Shimla Railway, Kashmir Valley, Kangra Valley and Neral-Matheran route. These coaches fare are equivalent to AC Executive Chair Car. IR also has plans to start Vistadome on Nilgiri mountain railway. EC Executive chair car: An air-conditioned coach with spacious seats and legroom. With four seats in a row, it is used for intercity day travel and is available on the Tejas , Shatabdi Express and Vande Bharat Express. CC AC chair car: An air-conditioned coach with five seats in a row, used for intercity day travel. Air-conditioned double-deck coaches are used on the Double Decker Express. SL Sleeper class: The sleeper class is the most common coach on IR, with ten or more SL coaches attached to a train rake. They are sleeping coaches with three berths across the width and two lengthwise, without air-conditioning. They carry 72 passengers per coach. 2S Second seater: similar to CC, without air-conditioning. Double-deck second seaters are used on the Flying Ranee. UR/GEN Unreserved/General: The least-expensive accommodation, with a seat not guaranteed. Tickets are valid on any train on a route if used within 24 hours of purchase. At the rear of the train is the guard's cabin. It contains a transceiver, and is where the guard usually gives the all-clear signal before the train departs. The Mumbai Rajdhani Express. The long-distance, high-speed Rajdhani Expresses connect state capitals and large cities with New Delhi. Trains are sorted into categories which dictate the number of stops on a route, their priority on the network and their fare structure. Each express train is identified by a five-digit number. if the first digit is 1 or 2 in the train number, they are long-distance express trains. If the first digit is 0, the train is a special train which will operate for a limited period of time with a different fare structure. A first digit of 5 denotes a passenger train. The second digit indicates the zone operating the train. However, for high-speed trains, the second digit is either 0 or 2 (the first remains 1 or 2). The third digit denotes the division within the zone which is responsible for maintenance and cleanliness, and the last two digits are the train's serial number. The train numbering system was changed from four digits from December 2010, to accommodate an increasing number of trains. Trains traveling in opposite directions along the same route are usually labelled with consecutive numbers. However, there is considerable variation in train numbers; some zones, such as Central Railway, have a less-systematic method of numbering trains. Trains are classified by average speed. A faster train has fewer stops (halts) than a slower one, and is usually used for long-distance travel. Most express trains have special names to identify them easily. The names of the trains usually denote the regions they connect, the routes they traverse, or a famous person or tourist spot connected with the train. Vande Bharat Express A semi-high-speed, air-conditioned day time journey train with facilities such as Wi-Fi, snack tables, CCTV cameras, hydraulic-pressure doors and a fire and smoke detection and extinguishing system. It can run at a speed of 200km/h. It is the first hi-tech Loco-less train set made in India. It was flagged off on 15th February 2019 by Prime Minister Narendra Modi. The model number for this particular train set is Train 18. Tejas Express A semi-high-speed, air-conditioned train which had its inaugural run on 24 May 2017, covering 551.7 kilometres (343 mi) in eight hours, 30 minutes. Coaches have bio-vacuum toilets, water-level indicators, tap sensors, hand dryers, integrated Braille displays, an LED TV for each passenger with a phone jack, local cuisine, Wi-Fi, tea and coffee vending machines, magazines, snack tables, CCTV cameras and a fire and smoke detection and extinguishing system. It can run at a speed of 200km/h but it is restricted to 130km/h due to some technical reasons. Shatabdi Express Air-conditioned, intercity trains for daytime travel. Unlike the Rajdhani or Duronto Expresses, the Shatabdi expresses make a round trip on the same day. The Bhopal Shatabdi Express (train number 12001/12002) is India's second-fastest train between New Delhi and Agra, with an average speed of 90 km/h (56 mph) and a top speed of 150 kilometres per hour (93 mph). The limited-stop trains have Wi-Fi. Rajdhani Express Limited-stop, air-conditioned trains linking state capital to national capital, they have a top speed of 130–140 km/h (81–87 mph). The 2014 railway budget proposed increasing the Rajdhani and Shatabdi Expresses to 180 km/h (110 mph). Duronto Express Non-stop (except for technical halts) service introduced in 2009. In January 2016, it became possible to book tickets from those technical stops. They connect India's metros and major state capitals, and were introduced to equal (or exceed) the speed of the Rajdhani Express. With air-conditioned one-, two- and three-tier seating, some have non-air-conditioned sleeper-class accommodations. Humsafar Express Air-conditioned, three-tier coach trains with LED screens displaying information about stations and train speed, a PA system, vending machines for tea and coffee, charging ports for electronic devices, bio-toilets, smoke alarms, CCTV cameras, curtains and heating and refrigeration facilities for food. Inaugural run was between Gorakhpur to Anand Vihar Terminal. AC Express Air-conditioned, limited-stop trains linking major cities, with a speed of about 130 km/h (81 mph). Uday Express Air-conditioned double decker train for overnight travel. Yuva Express Introduced with the Duronto Express to provide air-conditioned travel to young Indians, 60 percent of its seats were reserved for passengers between 18 and 45 years of age. The trains were unsuccessful, and operate only on the Delhi-Howrah and Delhi-Mumbai routes. Kavi Guru Express Introduced in honor of Rabindranath Tagore, four pairs of the trains operate on the network. Vivek Express Introduced to commemorate the 150th birth Anniversary of Swami Vivekananda in 2013, four pairs of Vivek Expresses run in the country. Rajya Rani Express Introduced to connect state capitals to major cities in that state. Mahamana Express Superfast train with Indian Railways ModelRake coaches. Intercity Express Introduced to connect major cities on short routes with high and semi-high speeds. Trains include the Deccan Queen, Flying Ranee and Bilaspur Nagpur Intercity Express. Antyodaya Express Non-reserved, high-speed LHB coaches on peak routes to ease congestion. Jan Sadharan Express Non-reserved express trains on peak routes to ease congestion. Suvidha Express High priority trains with dynamic pricing on high demand routes. Superfast Express Trains with a max speed greater than 100–110 km/h (62–68 mph), average speed greater than 55 km/h (34 mph), whose tickets have a superfast surcharge, with stops at very few stations. Express Trains with a max speed greater than 100 km/h (62 mph), average speed greater than 36 km/h (22 mph), with stops at few stations. Mail These trains earlier had separate mail coaches. Nowadays, mail is carried in luggage coach like all other trains. Passenger Slow, economical trains which stop at every (or almost every) station on a route. With generally-unreserved seating. The trains travel at about 40–80 km/h (25–50 mph). Suburban These trains operate in Mumbai, Delhi, Kolkata, Chennai, Hyderabad, Ahmedabad, Vadodara, Surat, Bengaluru, Pune and between Kanpur and Lucknow, usually stop at every station, and have unreserved seating. Metro Designed for urban transport, the first metro was the Kolkata Metro in 1984. There are 300 metro services daily carrying over 700,000 passengers making it the second busiest metro system in India. Mountain Railways Three of the lines were declared a World Heritage site as Mountain Railways of India by UNESCO. Indian Railway operates tourist train or coach services on popular tourist circuits in different regions of the country. The service offers tour packages inclusive of rail travel, local transportation, accommodation, food and guided tours. IR offers various tourist services in this segment including Luxury tourist trains, Semi luxury trains, Buddhist special trains, Bharat Darshan trains, Aastha Circuit trains and Steam trains. The Palace on Wheels is a luxury-train service, frequently hauled by a steam locomotive, to promote tourism in Rajasthan. The train has a seven-night, eight-day itinerary on a round trip from New Delhi via Jaipur, Sawai Madhopur and Chittaurgarh, Udaipur, Jaisalmer, Jodhpur, Bharatpur and Agra. Royal Rajasthan on Wheels covers a number of tourist destinations in Rajasthan. The seven-day, eight-night tour is a round trip from New Delhi's Safdarjung station via Jodhpur, Udaipur and Chittaurgarh, Ranthambore National Park and Jaipur, Khajuraho, Varanasi and Sarnath, and Agra. Maharajas' Express, a luxury train operated by the Indian Railway Catering and Tourism Corporation (IRCTC), runs on five routes to about 12 destinations across north-West and central India (centered around Rajasthan) from October to April. The Deccan Odyssey covers tourist destinations in Maharashtra and Goa. Its seven-night, eight-day tour begins in Mumbai and stops at Jaigad Fort, Ganapatipule and Ratnagiri, Sindhudurg, Tarkarli and Sawantwadi, Goa, Kolhapur and Pune (Day 5), Aurangabad and Ellora Caves, and Ajanta Caves and Nashik. The Golden Chariot runs on two tours: Pride of the South and Splendor of the South. The Golden Chariot is a luxury train service. The Mahaparinirvan Express, an air-conditioned service also known as the Buddhist Circuit Train, is run by the IRCTC for Buddhist pilgrims. Its seven-night, eight-day tour begins in New Delhi and visits Bodh Gaya, Rajgir and Nalanda, Varanasi and Sarnath, Kushinagar and Lumbini, Sravasti and the Taj Mahal. The Fairy Queen, a tourist attraction as the world's oldest operating steam engine, hauls a luxury train from Delhi to Alwar. Until the late 1980s, Indian Railways ticket reservations were made manually. In late 1987, IR began using a computerized ticketing system. The system went online in 1995 to provide current information on status and availability. The ticketing network at stations is computerized with the exception of remote areas, As of March 2017, close to 6000 stations are networked with reserved or unreserved ticketing systems across India. IR now provides multiple channels for passengers to book tickets between any two train stations in the country. Reserved tickets may be booked, up to 120 days in advance, on the Indian Railway Catering and Tourism Corporation website, smartphone apps, SMS, rail reservation counters at train stations or through private ticket booking counters. A Tatkal train ticket can be booked by passengers who want to travel at short notice with a reserved seat or berth, but such tickets are sold at higher fares than regular advance reservation tickets. Confirmed reservation tickets will show the passenger and fare details along with berth or seat number(s) allocated to them on the ticket. If the reservation is not available on a particular train, the ticket has a wait-list number. A person with a wait-listed ticket must wait for enough cancellations to obtain a confirmed ticket. If their ticket is not confirmed on the day of departure, they cannot board the train. Reservation against Cancellation tickets, between the waiting and confirmed lists, allow a ticket holder to board the train and obtain a seat chosen by a ticket collector after the collector has found a vacant seat. Unreserved tickets, for short distance or unplanned travels, may be purchased at stations at any time before departure, and such ticket holders may only board the general compartments. Suburban networks issue unreserved tickets valid for a limited time or season passes with unlimited travel between two stops for a period of time. Commuters can purchase tickets and season passes at stations or through UTS mobile apps. A valid proof for the purchase of ticket along with photo identification is required to board the train. India has some of the lowest train fares in the world, and passenger traffic is subsidised by higher-class fares. Discounted tickets are available for senior citizens (over age 60), the differently-abled, students, athletes and those taking competitive examinations. One compartment of the lowest class of accommodation is earmarked for women on every passenger train. Some berths or seats are also reserved for women or senior citizens. In the freight segment, IR ferries various commodities and fuels in industrial, consumer and agricultural segments across the length and breadth of India. IR has historically subsidised the passenger segment with income from the freight business. As a result, freight services are unable to compete with other modes of transport on both cost and speed of delivery, leading to continuous erosion of market share. To counter this downward trend, IR has started new initiatives in freight segments including upgrading of existing goods sheds, attracting private capital to build multi-commodity multi-modal logistics terminals, changing container sizes, operating time-tabled freight trains and tweaking with the freight pricing/product mix. Also, end-to-end integrated transport solutions such as roll-on, roll-off (RORO) service, a road-rail system pioneered by Konkan Railway Corporation in 1999 to carry trucks on flatbed trailers, is now being extended to other routes across India. Perhaps the game changer for IR in the freight segment, are the new dedicated freight corridors that are expected to be completed by 2020. When fully implemented, the new corridors, spanning around 3300 km, could support hauling of trains up to 1.5 km in length with 32.5 ton axle-load at speeds of 100 kilometres per hour (62 mph). Also, they will free-up capacity on dense passenger routes and will allow IR to run more trains at higher speeds. Additional corridors are being planned to augment the freight infrastructure in the country. IR has two UNESCO World Heritage Sites: the Chhatrapati Shivaji Maharaj Terminus, Mumbai and the mountain railways of India. The latter are three rail lines in different parts of India: the Darjeeling Himalayan Railway, a 610 mm (2 ft) narrow-gauge railway in the Lesser Himalayas of West Bengal; the Nilgiri Mountain Railway, a 1,000 mm (3 ft 3 3⁄8 in) metre gauge rack railway in the Nilgiri Hills of Tamil Nadu and the Kalka-Shimla Railway, a 762 mm (2 ft 6 in) narrow-gauge railway in the Siwalik Hills of Himachal Pradesh. IR carries an annual debt of over ₹200 billion (US$2.8 billion). The passenger division lost ₹300 billion (US$4.2 billion) in FY 2013–2014, leading to a 23 paise (0.32¢ US) loss per passenger-km and a cash surplus of ₹6.9 billion (US$96 million). Its operating ratio was 109 percent from April to December 2016. It's accounting systems are allegedly outdated. Between 2004 and 2014, 99 new rail projects were announced in the annual Rail Budgets without additional funding. One project has been completed; the remaining 98 will require ₹5 trillion (US$70 billion), including four projects which were 30 years old in 2014. IR is losing passenger and freight market share to other modes of transport. According to the Report of High Level Safety Review Committee of 2012, from 2007–08 to October 2011 casualties in train accidents accounted for 1,019 deaths and 2,118 injuries. In the same period 1,600 railway staff were killed and 8,700 injured. The committee estimated that almost 15,000 persons get killed each year by what is called unlawful trespassing. A Daily Telegraph article stated that Indian Railway officials believe that a large proportion of bodies found dead on railways died elsewhere and were put on the railway in dishonest attempts to get compensation from the railway authorities and companies. IR carries out various activities that are essentially uneconomic in nature, where it is either not able to recover the costs (capital investments/operating costs) it incurs to deliver such services, or ends up foregoing revenues. Such activities, termed by IR as Social Service Obligations, include concessional tariffs for a few passenger segments or essential commodities and services in uneconomical train routes. While the assessment of actual losses to meet social service obligations requires a scientific study, the estimation of such losses from IR for the fiscal year 2016–17 is ₹296.3 billion (US$4.1 billion). IR's Research Design and Standards Organisation (RDSO) undertakes research, design and standardisation. The railway has undertaken several initiatives to upgrade its ageing infrastructure and improve its quality of service. The Indian government plans to invest ₹9.05 trillion (US$130 billion) to upgrade IR by 2020. Infrastructure modernisation projects include high-speed rail, with the first Ahmdabad-Mumbai train in operation in 2022; redevelopment of 400 stations by monetizing 2,700 acres (11 km2) of spare railway land under a ₹1,070,000 crore (US$149 billion) plan; doubling tracks to reduce congestion and delays while improving safety (15,000 km of double track existed in 2016, and funding for 12,500 km more was approved that year); the refurbishing of 12- to 15-year-old coaches at the Carriage Rehabilitation Workshop in Bhopal to enhance passenger amenities and fire safety; Global Positioning System (GPS)-enabled tracking of trains to improve safety and service; Digital India-driven ₹3,500,000 million (equivalent to ₹3.7 trillion or US$51 billion in 2018) digitalisation of the railway to improve efficiency and reduce cost; rainwater harvesting, with 1885 systems installed by December 2016, and reforestation of railway land and along the tracks. All routes will be electrified to save on imported-fuel costs. 49 percent of the network was electrified by March 2018, with full electrification planned by March 2021. Off-the-grid Solar-powered trains are planned with the installation of one gigawatt of solar and 130 megawatts of wind power between 2017 and 2022; India introduced the world's first solar-powered train and 50 coaches with rooftop solar farms in June 2017. Initial assessments of this experiment has been positive.Rooftop solar electricity is planned at stations to reduce long-term fuel costs and protect the environment, and sustainable LED lighting at all stations is planned by March 2018 to cut electricity costs. Locomotive factories have been modernised, including two new factories in Bihar: an electric locomotive factory in Madhepura and a diesel locomotive factory in Marhaura, and 2,285 bio-toilets were introduced from April to July 2014. A ₹200 billion (US$2.8 billion) partnership with Alstom to supply 800 electric locomotives from 2018 to 2028 was announced. Safety projects include the elimination of an average of 1,217 unguarded level crossings per year by building an average of 1,066 overpasses and underpasses per year; an automated fire alarm system on Rajdhani Express trains was begun in 2013, extending to the air-conditioned coaches of all trains, and 6,095 GPS-enabled Fog Pilot Assistance System railway signalling devices (replacing the practice of placing firecrackers on tracks to alert train drivers) installed in 2017 in four zones: Northern, North Central, North Eastern and North Western. Vivek Express has the longest route in India, which covers 4,286 km in about 82 hours and 30 minutes. The train runs between Dibrugarh and Kanyakumari. In its route, Howrah-Amritsar Express has 115 stops. The train has the record for maximum stops by an Express/Mail train. The fastest train in India is Vande Bharat Express which runs between Delhi and Varanasi. ^ This classification system does not apply to steam locomotives, which retained their original class names (such as M class or WP class). ^ a b c "[IRFCA] Indian Railways FAQ: IR History: Early Days – 1". www.irfca.org. Archived from the original on 7 March 2005. Retrieved 3 January 2014. ^ a b c d "Indian Railways Budget Documents 2018–19" (PDF). Ministry of Railway. Archived (PDF) from the original on 10 February 2018. Retrieved 22 February 2018. ^ a b c d e f g h i j k "Indian Railways Statistical Publications 2016–17: Statistical summary – Indian Railways" (PDF). Ministry of Railway. Archived (PDF) from the original on 22 February 2018. Retrieved 22 February 2018. ^ a b c d e f g "Indian Railways Statistical Publications 2016–17: Statistics for Track and Bridges – Indian Railways" (PDF). Ministry of Railway. Archived (PDF) from the original on 22 February 2018. Retrieved 22 February 2018. ^ "Indian Railways Statistical Publications 2016–17: Passenger Business" (PDF). Ministry of Railway. p. 23. Archived (PDF) from the original on 3 March 2018. Retrieved 2 March 2018. ^ Indian Railways Statistical Publications 2016–17. "extrastats-summary" (PDF). Archived (PDF) from the original on 23 February 2018. ^ a b c "[IRFCA] India's First Railways". www.irfca.org. ^ "164 Years Ago On This Day, India's First Train Ran From Mumbai To Thane". Archived from the original on 29 July 2017. Retrieved 24 July 2017. ^ "India's 1st train: When Sahib, Sindh & Sultan blew steam – Times of India". Archived from the original on 8 August 2017. Retrieved 24 July 2017. ^ "Extracts from the Railway Times". Railway Times. 1854. Retrieved 1 Jan 2019. ^ "Legacy of First Railway Station of South India". RailNews Media India Ltd. Archived from the original on 29 July 2017. Retrieved 24 July 2017. ^ "Kolkata's trams – A ride through history". 2 March 2016. Archived from the original on 29 July 2017. Retrieved 24 July 2017. ^ "The Evolution of Trams in Mumbai". The Urban Imagination – Faculty of Arts and Sciences. Harvard University. Archived from the original on 11 October 2017. Retrieved 18 May 2018. ^ "Welcome to Official Website of CORE". www.core.indianrailways.gov.in. Archived from the original on 7 August 2017. Retrieved 26 July 2017. ^ "History of Railways". www.kportal.indianrailways.gov.in. Archived from the original on 21 July 2017. Retrieved 24 July 2017. ^ "160 years of Indian Railways: Here's how AC trains were kept cool". 2 April 2013. ^ "Shatabdi Express – Shatabdi Express Train, Shatabadi Express Timetable, Shatabadi Express Schedule Booking India". www.iloveindia.com. Archived from the original on 15 July 2017. Retrieved 24 July 2017. ^ "Indian Railway". www.indianrailways.gov.in. Archived from the original on 24 July 2017. Retrieved 24 July 2017. ^ "IRCTC Next Generation eTicketing System". www.irctc.co.in. Archived from the original on 24 July 2017. Retrieved 24 July 2017. ^ a b "48 per cent rail tracks electrified, aim to double it in 5 years: Govt". 31 March 2017. Archived from the original on 18 July 2017. Retrieved 24 July 2017. ^ "Organization Structure" (PDF). Indian Railways. 2015. Archived (PDF) from the original on 17 May 2017. Retrieved 2 March 2017. ^ "Indian Railways Report" (PDF). Indian Railways. 2015. Archived (PDF) from the original on 17 May 2017. Retrieved 2 March 2017. ^ Singh, Vijay Pratap (27 February 2010). "SMS complaint system: A Northern Railway brainwave spreads". Indian Express. Retrieved 19 January 2012. ^ Indian Railways Facts and Figures (2011–2012). Ministry of Railways, Government of India. 2012. p. personnel. Archived from the original on 14 October 2013. Retrieved 21 July 2013. ^ "Zones and their Divisions in Indian Railways" (PDF). Indian Railways. Archived from the original (PDF) on 19 March 2015. Retrieved 26 August 2011. ^ Indian Railways Statistical Publications 2016–17. "stats-network" (PDF). Archived (PDF) from the original on 19 June 2018. ^ "Indian Railways Annual Publication 2016–17 – Undertakings" (PDF). 28 February 2018. Archived (PDF) from the original on 1 March 2018. ^ "PRCL". Archived from the original on 24 October 2017. Retrieved 28 February 2018. ^ "Railway Board Directorates". INDIAN RAILWAY ESTABLISHMENT CODE. Indian Railways. Archived from the original on 30 May 2012. ^ a b Indian Railways Statistical Publications 2016–17 – Personnel. "stats-personnel" (PDF). Archived (PDF) from the original on 23 February 2018. ^ "Indian Railways level which constitutes the Governing Council of Association". irts.org.in. Archived from the original on 2 August 2012. ^ "Indian Railways Establishment Manual". rrcb.gov.in. Archived from the original on 25 May 2012. ^ "RRB NTPC exam 2016". indianexpress.com. Archived from the original on 20 July 2016. ^ "India's first CNG train flagged off". Archived from the original on 26 February 2015. Retrieved 26 February 2015. ^ "New Technology allows Railways to save Rs 20 Lakhs Diesel per Engine". Archived from the original on 8 September 2013. Retrieved 6 September 2013. ^ "Indian Railways Statistical Publications 2016–17 : Rolling Stock Summary" (PDF). Archived (PDF) from the original on 26 February 2018. Retrieved 25 February 2018. ^ Railways, Ministry of (25 January 2018). "End of an Era - The historic last ICF Coach was flagged off by Senior Techcnician Shri Bhaskar P in the presence of Railway Board Chairman Shri @AshwaniLohani. The 1st ICF coach had been flagged by Prime Minister Shri Lal Bahadur Shastri on 2 October, 1955.pic.twitter.com/qCfl8tVrQy". @railminindia. Archived from the original on 26 July 2018. Retrieved 27 February 2018. ^ "After spate of accidents, Indian Railways speeds up safety plan; check out the massive task and big numbers involved". The Financial Express. 7 September 2017. Archived from the original on 28 February 2018. Retrieved 27 February 2018. ^ "Indian Railways Passenger Coaches: Safety Features and Technologies Adopted" (PDF). International Journal of Engineering Technology Science and Research. April 2017. Archived (PDF) from the original on 28 February 2018. Retrieved 27 February 2018. ^ "At 176 Kmph, These Two Upcoming Trains May Be India's Fastest Ever!". The Better India. 22 January 2018. Archived from the original on 28 February 2018. Retrieved 27 February 2018. ^ "Loco hauled commuter trains to be replaced with DEMU/MEMU – Times of India". The Times of India. Archived from the original on 26 February 2018. Retrieved 25 February 2018. ^ a b "Indian Railways Statistical Publications 2016–17 – Rolling Stock" (PDF). 25 February 2017. Archived (PDF) from the original on 28 February 2018. ^ a b c "Brief on Railway Electrification". Archived from the original on 26 September 2015. Retrieved 1 November 2016. ^ a b "Railway Electrification Market in India 2018". Enincon. 20 February 2018. Archived from the original on 20 March 2018. Retrieved 20 March 2018. 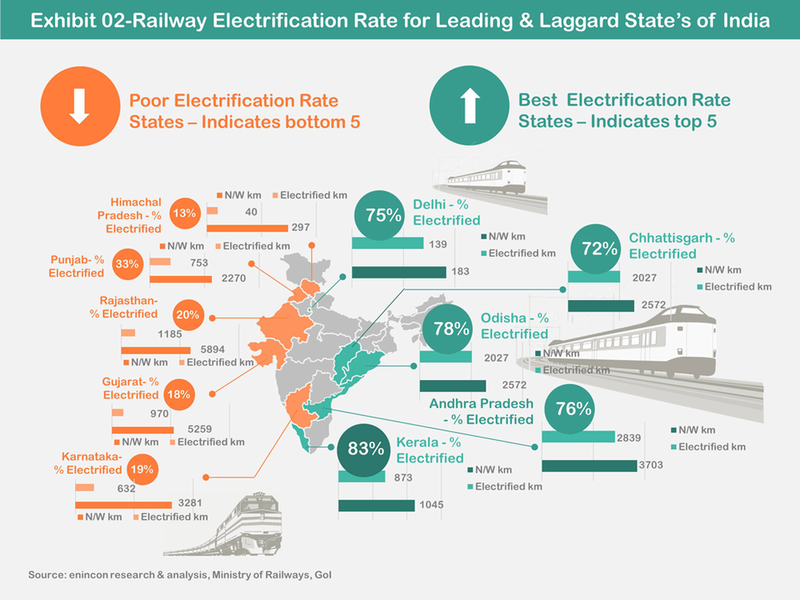 ^ "Railway Electrification Market in India 2018" (PDF). Enincon. 20 February 2018. Archived (PDF) from the original on 20 March 2018. Retrieved 20 March 2018. ^ a b c d "Indian Railways – Statistical Publication 2016–17 – Signalling and Telecom" (PDF). 28 February 2018. Archived (PDF) from the original on 1 March 2018. ^ "Art of the token exchange". Railscapes. 25 July 2017. Archived from the original on 28 February 2018. Retrieved 28 February 2018. ^ "Signalling System". IRFCA.org. Indian Railways Fan Club. Retrieved 4 June 2007. ^ "[IRFCA] Indian Railways FAQ: Signal Aspects and Indications – Principal Running Signals". www.irfca.org. Retrieved 28 February 2018. ^ "Indian Railways clears proposal to equip electric locomotives with European train protection systems- Technology News, Firstpost". Tech2. Archived from the original on 3 February 2018. Retrieved 28 February 2018. ^ "Bandhan Express, New Train Between Bengal And Bangladesh: 10 Facts". NDTV.com. Archived from the original on 16 November 2017. Retrieved 16 November 2017. ^ "Bandhan Express makes its first commercial run between Kolkata and Khulna today". The Indian Express. 16 November 2017. Archived from the original on 16 November 2017. Retrieved 16 November 2017. ^ "Brief on the matter relating to Nepal" (PDF). Official webpage of Indian Railways. Retrieved 1 June 2009. ^ Das, Koushik. "Construction Work Of New India-Bangladesh Railway Link To Begin In 2015". InSerbia News. Archived from the original on 9 September 2014. Retrieved 26 August 2014. ^ "Work on new India-Bangladesh railway link from 2015-INews – IBNLive Mobile". IBNlive. 18 June 2014. Archived from the original on 6 October 2014. Retrieved 26 August 2014. ^ "Indian Railway to build a 15-km track linking Agartala with Bangladesh". Archived from the original on 6 October 2014. Retrieved 26 August 2014. ^ "Work on Agartala-Akhaura rail link to commence soon". The Times of India. Archived from the original on 6 October 2014. Retrieved 26 August 2014. ^ "Work on new India-Bangladesh railway link from 2015". The Times of India. Archived from the original on 18 July 2014. Retrieved 26 August 2014. ^ "India, Bangladesh align rail link in Tripura". Meghalaya Times. Archived from the original on 6 October 2014. Retrieved 26 August 2014. ^ "India's rail-building challenge". By Sudha Ramachandran. Asia Times. 3 January 2007. p. 2. Retrieved 16 April 2009. ^ "India signs trans-Asian railways pact". Indo-Asian News Service. 2 July 2007. p. 1. Retrieved 16 April 2009. ^ "IRFCA:Indian Railways FAQ:Geography:International". IRFCA, website of the Indian Railway Fan Club. Retrieved 24 June 2009. ^ a b Railways revise station categories to improve services Archived 17 March 2018 at the Wayback Machine, Economic Times, 28 December 2017. ^ "Premium railway fares hiked up to 50 per cent in new dynamic pricing model". 8 September 2016. Archived from the original on 9 September 2016. Retrieved 8 September 2016. ^ "Accommodation Classes in Indian Railways". Indian Railways. Archived from the original on 26 April 2017. Retrieved 15 November 2016. ^ a b "General Information on travelling by IR". IRFCA.org. Indian Railways Fan Club. Retrieved 3 June 2007. ^ "Class of Travel". indiarail.co.uk. S.D. Enterprises Ltd. Archived from the original on 13 May 2007. Retrieved 3 June 2007. ^ a b c d "The system of train numbers". IRFCA.org. Indian Railways Fan Club. Retrieved 3 June 2007. ^ "New Train Number Enquiry". Indian Railways Passenger Reservation Inquiry. Centre For Railway Information Systems. Archived from the original on 24 November 2010. Retrieved 5 February 2011. ^ "railway operations — I". IRFCA.org. Indian Railways Fan Club. Retrieved 11 June 2007. ^ "Train names". IRFCA.org. Indian Railways Fan Club. Retrieved 3 June 2007. ^ Sekhsaria, Pankaj (24 June 2005). "What's in a Train Name?". The Hindu Business Line. Archived from the original on 8 June 2007. Retrieved 4 June 2007. ^ "Toy Trains of India". Our Trips – Royal Train Tours. India Calling Tours (P) Limited. Archived from the original on 8 August 2007. Retrieved 12 May 2007. ^ a b "Indian Railways Statistical Publications – Passenger Business" (PDF). Archived (PDF) from the original on 2 March 2018. ^ "NPalace on wheels – Exclusive Indian train was originally used by royalty". Times of India. 13 October 2012. Archived from the original on 17 October 2012. ^ "Royal Rajasthan on Wheels Itinerary | Tour Program for 2014–15". Royalsrajasthanonwheels.com. Archived from the original on 31 March 2014. Retrieved 27 April 2014. ^ "The Maharajas' Express Train Journeys Season 2014–2015". The-maharajas.com. Archived from the original on 28 February 2014. Retrieved 27 April 2014. ^ "Ministry of Railways (Railway Board)". Archived from the original on 5 November 2013. Retrieved 26 January 2014. ^ "Tour Itinerary – Tour Itinerary of Golden Chariot Train, Itinerary of Golden Chariot Train". Goldenchariottrain.com. Archived from the original on 14 April 2014. Retrieved 27 April 2014. ^ "Southern Splendour Tour – South India Tour and South India Tour Package". Goldenchariottrain.com. Archived from the original on 14 April 2014. Retrieved 27 April 2014. ^ "Ministry of Railways (Railway Board)". Indianrailways.gov.in. Archived from the original on 10 April 2014. Retrieved 27 April 2014. ^ "Tatkal Ticket Booking: Charges, timings, cancellation and more – Times of India". The Times of India. Archived from the original on 12 June 2018. Retrieved 2 March 2018. ^ Cite error: The named reference reserve rules was invoked but never defined (see the help page). ^ "UTS Mobile Ticketing". www.utsonmobile.indianrail.gov.in. Archived from the original on 8 January 2015. Retrieved 2 March 2018. ^ Joshi, V; I. M. D. Little (17 October 1996). "Industrial Policy and Factor Markets". India's Economic Reforms, 1991–2001. USA: Oxford University Press. p. 184. ISBN 0-19-829078-0. Retrieved 25 June 2007. ^ "Reservation Rules". Indian Railways. Archived from the original on 24 June 2007. Retrieved 25 June 2007. ^ "Indian Railways White Paper 2016" (PDF). 25 February 2018. Archived (PDF) from the original on 26 February 2018. ^ "INDIAN RAILWAYS 2017–2019 VISION & PLANS" (PDF). 25 February 2018. Archived (PDF) from the original on 18 November 2017. ^ "Road-Rail Synergy System". Press release, Press Information Bureau, dated 2004-20-05. Archived from the original on 5 June 2011. Retrieved 22 December 2008. ^ "Chhatrapati Shivaji Maharaj Terminus (formerly Victoria Terminus)". World Heritage List. World Heritage Committee. 2004. Archived from the original on 19 December 2008. Retrieved 5 January 2009. ^ a b "Mountain Railways of India". World Heritage List. World Heritage Committee. 1999. Archived from the original on 19 December 2008. Retrieved 5 January 2009. ^ a b "Railway Budget 2014–15" (PDF). Archived (PDF) from the original on 10 July 2014. Retrieved 20 July 2014. ^ Sood, Jyotika (16 February 2017). "Railways' operating ratio touches a record 109% in April–December". Livemint. Archived from the original on 18 February 2017. Retrieved 19 February 2017. ^ Lohumi, Manasi (20 December 2016). "Railways moves towards accounting reforms". livemint.com. Archived from the original on 26 February 2018. Retrieved 25 February 2018. ^ Bibek Debroy and Kishore Desai (25 February 2018). "Reviewing the Impact of Social Service Obligations by Indian Railways" (PDF). Archived (PDF) from the original on 15 February 2017. ^ "Indian Railways Year Book 2016–17, Social Service Obligations" (PDF). Archived (PDF) from the original on 25 February 2018. ^ a b "GE, Alstom land $5.6-billion deals to supply locomotives for railways". Economic Times. 10 November 2015. Archived from the original on 12 November 2015. Retrieved 13 November 2015. ^ "Diamond quadrilateral of high-speed trains – A Dastidar, Indian Express, 10 June 2014". Archived from the original on 13 August 2017. Retrieved 22 June 2017. ^ "India to sign deal with Japan to get first bullet train – The Hindu". Archived from the original on 2 August 2017. Retrieved 22 June 2017. ^ "India Said to Pick Japan for High-Speed Rail Project – WSJ". Archived from the original on 18 May 2017. Retrieved 22 June 2017. ^ Railways appoints IRSDC as nodal agency for station redevelopment Archived 23 December 2017 at the Wayback Machine, Livemint, 5 December 2017. ^ a b c d Indian Railways orders conversion to Broad Gauge Archived 23 December 2017 at the Wayback Machine, Rail Digest, 12 April 2017. ^ "Indian Railways gets first model rake of luxury 'Make in India' coaches". The Economic Times. Bennett, Coleman & Co. Ltd. 11 January 2016. Archived from the original on 14 January 2016. Retrieved 13 January 2016. ^ "Indian Railways unveils 'Make in India' train coaches with new look". The Financial Express. The Indian Express Group. 13 January 2016. Archived from the original on 15 January 2016. Retrieved 13 January 2016. ^ "Just like your cabs, you can soon track trains in real time via GPS | Latest News & Updates at Daily News & Analysis". DNA India. 30 November 2017. Archived from the original on 2 December 2017. Retrieved 30 November 2017. ^ Rain Water Harvesting System In Indian Railway Archived 23 December 2017 at the Wayback Machine, 7 December 2016. ^ India Plants 50 Million Trees in One Day, Smashing World Record Archived 23 December 2017 at the Wayback Machine, National Geographic, July 2016. ^ "India's first solar-powered DEMU train launched". The Hindu. Archived from the original on 26 July 2018. Retrieved 23 July 2017. ^ Railways, IIT-Madras tie up to power AC coaches with solar energy. The Times of India (5 August 2013). Retrieved on 17 August 2013. ^ "NORTHERN RAILWAYS TO INSTALL 5 MW ROOFTOP SOLAR IN FOUR OF ITS STATIONS". Archived from the original on 3 March 2017. Retrieved 3 March 2017. ^ Indian Railways plans to make all stations 100% LED lit by 31 March 2018 Archived 18 May 2018 at the Wayback Machine, Times of India, 19 December 2017. ^ "Locomotive Factories in Bihar: In cold storage for years, two Railway projects to start soon". Indian Express. 30 October 2015. Archived from the original on 31 October 2015. Retrieved 31 October 2015. ^ "GE Gets $2.6 Billion Indian Railways Contract". Wall Street Journal. 9 November 2015. Archived from the original on 9 November 2015. Retrieved 9 November 2015. ^ "Rail ministry awards Rs 14,656-cr Marhowra locomotive project to GE". Business Standard. 9 November 2015. Archived from the original on 12 November 2015. Retrieved 9 November 2015. ^ Indian Railways commissions around 4800 kilometer of broad gauge track in last two financial years which is a record performance Archived 11 June 2016 at the Wayback Machine, 12 May 2016. ^ "Indian Railways develops Automatic Fire and Smoke Detection System". Archived from the original on 8 September 2013. Retrieved 5 September 2013. ^ "Indian Railways to use GPS-enabled devices to fight fog this season", The Economic Times, 12 December 2017. "IR History: Early Day". Indian Railways Fan Club. Retrieved 19 June 2005. "Zones". Indian Railways Fan Club. Retrieved 26 June 2005. "Locomotives". Indian Railways Fan Club. Retrieved 26 June 2005. "Production Units & Workshops". Indian Railways Fan Club. Retrieved 26 June 2005. "Signalling Systems". Indian Railways Fan Club. Retrieved 26 June 2005. "Geography : International". Indian Railways Fan Club. Retrieved 26 June 2005. "Rolling stock". Indian Railways Fan Club. Retrieved 26 June 2005. "Signal Aspects and Indications – Principal Running Signals". Indian Railways Fan Club. Retrieved 26 June 2005. "Salient Features of Indian Railways". Indian Railways. Archived from the original on 18 June 2005. Retrieved 19 June 2005. "Indian Railways Online Passenger Reservation Site". Indian Railways. Archived from the original on 1 June 2014. Retrieved 10 June 2005. Bangalore railway division is one of the three railway divisions under South Western Railway zone of Indian Railways. This railway division was formed on 5 November 1951 and its headquarter is located at Bangalore in the state of Karnataka of India. Mysore railway division, and Hubli railway division are the other railway divisions under SWR Zone headquartered at Hubli. Bholu or Bholu the Train Manager (Guard) elephant is the mascot of Indian Railways. The mascot -a cartoon of an elephant holding a signal lamp with a green light in one hand- was initially designed for Indian Railways' 150th year commemoration events and was unveiled on 16 April 2002 in Bangalore. Later in 2003, Indian Railways decided to permanently retain it as the official mascot. The icon was placed on the reverse of a coin. Central Railway (abbreviated CR and मध्य) is one of the 18 zones of Indian Railways. Its headquarters is in Mumbai at Chhatrapati Shivaji Maharaj Terminus. It has the distinction of operating first passenger railway line in India, which opened from Mumbai to Thane on 16 April 1853. The EMD GT46PAC or WDP-4 is a passenger-hauling diesel-electric locomotive with AC electric transmission designed by General Motors Electro-Motive Division and built by both GM-EMD and under license by Diesel Locomotive Works (DLW) of Varanasi, India for Indian Railways as their classes WDP-4, WDP-4B and WDP-4D. The GT46PAC is a passenger version of the previous Indian Railways EMD GT46MAC freight locomotive. The locomotive has a 16-cylinder 710G3B diesel engine with a maximum speed of 904 RPM. The East Coast Railway (abbreviated ECoR and पूतरे) is one of the 18 railway zones of Indian Railways. It came into existence on 1 April 2003. As the name suggests, most of the railway routes of the zone are near the east coast of India. The headquarters of the zone are at Bhubaneswar. The Eastern Railway (abbreviated ER and পূর্ব, पूरे / पूर्व) is among the 18 zones of the Indian Railways. Its headquarters is at Fairley Place, Kolkata and comprises four divisions: Howrah, Malda, Sealdah, and Asansol. Each division is headed by a Divisional Railway Manager (DRM). The name of the division denotes the name of the city where the divisional headquarters is located. Eastern Railway Consists Most no. of A1 and A Category Stations like Howrah, Sealdah, Bhagalpur, Asansol, Durgapur etc. Eastern Railways operates one of the oldest trains of India, Kalka Mail. 3 Popular Zones ECR, SER (again from SER-ECOR and SECR carved out in 2003) NFR were part of ER before. Kanchrapara Workshop is for POH of electric locomotives, EMU Locals and coaches. Hubli railway division is one of the three railway divisions under South Western Railway zone of Indian Railways. This railway division was formed on 5 November 1951 and its headquarter is located at Hubli in the state of Karnataka of India. Bangalore railway division and Mysore railway division are the other railway divisions under SWR Zone headquartered at Hubli. Indian Railway Catering and Tourism Corporation (IRCTC) is a subsidiary of the Indian Railways that handles the catering, tourism and online ticketing operations of the Indian railways, with around 5,50,000 to 6,00,000Template:MOS:DIGITS bookings every day is the world's second busiest and highest of 15 to 16 lakh tickets every day. Its tagline is "Lifeline of the nation". Indian Railways offers various travel classes on their coaches. Depending upon their travel class, the passenger cars feature different seating arrangements or berths subject to availability. The efficient running of the North-east Indian railways during World War II became critical to the success of the Allied war effort in the South-East Asian Theatre. At the start of the War the railways and water communications of north-east Indian Railways was not a major concern for the British Empire forces stationed in Burma as they could be supplied by sea through port in Rangoon (as could Chinese forces in south western China thought supplies passing up the Burma Road). However, when the Japanese attacked and forced the British back to the Indian Burmese border, the supply of material over the extended lines of communication from Calcutta to the front lines and over the Hump into China, became a critical issue for the Western Allies and the Chinese National Revolutionary Army (NRA) under the command of Generalissimo Chiang Kai-shek. War time expediency, investment and ingenuity increased rail tonnage from around 600 tonnes a day to over 7,300 by January 1946. Rail transport is an important mode of transport in India. All main-line rail operations in India are handled by Indian Railways (IR), a state-owned organization of the Ministry of Railways. As of March 2017, the rail network comprises 121,407 km (75,439 mi) of track over a route of 67,368 km (41,861 mi) and 7,349 stations. It is the fourth-largest railway network in the world (after those of the United States, Russia and China). Forty nine percent of the routes are electrified with 25 KV AC electric traction while thirty-three percent of them are double or multi-tracked.It is one of the busiest networks in the world, transporting 8.107 billion passengers and over 1.108 billion tonnes of freight annually, as of 2016. Indian Railways is the world's eighth largest employer, with more than 1.308 million employees as of March 2017. As of March 2017, IR's rolling stock consisted of 277,987 freight wagons, 70,937 passenger coaches and 11,452 locomotives. IR owns locomotive and coach-production facilities at several locations in India. The urban rail transit systems across the country are operated independently of Indian Railways. There are currently 11 operational rapid transit (also called 'metro') systems in ten cities in India. As of November 2017, India has 425 kilometres (264 miles) of operational metro lines and 347 stations. A further 500+ km of lines are under construction. Salem Railway Division is a railway division of the Southern Railway Zone of Indian Railways. It was carved out of the Palakkad railway division in 2006. It covers 15 districts in Tamil Nadu and has a total route length of 862 km (536 mi). Coimbatore Junction is the most busiest railway station in this division and accounts for 45% of the revenues. Other major railway stations include Erode Junction, Salem Junction, Tiruppur, Coimbatore North Junction, Pothanur Junction, Karur Junction, Irugur Junction, Omalur Junction. Erode loco shed holds WDM-2, WDM-3A, WDM-3D, WDG-3A, WDG-4, WAG-7 and WAP-4 locos and is home to the largest fleet of WAP-4 locos on Indian Railways. The South Central Railway (abbreviated SCR and दमरे) is one of the 18 zones of Indian Railways. The jurisdiction of the zone is spread over the states of Maharashtra, Telangana, and some portions of Madhya Pradesh. It has three divisions under its administration, which include Nanded, Secunderabad, Hyderabad. The South Eastern Railway (abbreviated SER) is one of the 18 railway zones in India and Part of Eastern Railways. It is headquartered at Garden Reach, Kolkata, West Bengal, India. It comprises Adra railway division, Chakradharpur railway division, Kharagpur railway division and Ranchi railway division. The West Central Railway (abbreviated WCR and पमरे), one of the 18 zones of the Indian Railways, came into existence on 1 April 2003. It is headquartered at Jabalpur. The Western Railway (abbreviated WR and प रे) is one of the 18 zones of Indian Railways, and is among the busiest railway networks in India. The major railway routes of Indian Railways which come under Western Railways are: Mumbai Central - Ratlam, Mumbai Central - Ahmedabad and Palanpur - Ahmedabad. The railway system is divided into six operating divisions: Vadodara, Ahmedabad, Rajkot, Bhavnagar, Ratlam, and Mumbai Central. Vadodara railway station, being the junction point for the Ahmedabad - Mumbai route and the Mumbai - Ratlam route towards New Delhi, is the busiest junction Station in Western Railways and one of the busiest junctions of Indian Railways too, while Ahmedabad Division earns highest revenue followed by Mumbai Division and Vadodara Division. Surat railway station is one of the busiest railway station in Western Railway in non-junction category where more than 160 trains pass per day. Western Railway General Manager's official bungalow 'Bombarci' (abbreviation of Bombay, Baroda and Central India) is located on Altamont road in Cumbala hill, Mumbai. Each of the divisions is headed by a Divisional Railway Manager (DRM), who reports to the General Manager (GM) of the zone. A DRM can be appointed from any of the eight organized services of Indian Railways, viz. Indian Railway Traffic Service (IRTS), Indian Railway Accounts Service (IRAS), Indian Railway Personnel Service (IRPS), Indian Railway Service of Engineers (IRSE), Indian Railway Service of Mechanical Engineers (IRSME), Indian Railway Service of Electrical Engineers (IRSEE), Indian Railway Service of Signal Engineers (IRSSE) and Indian Railway Stores Service (IRSS) for the tenure of three years, but it can be exceeded on the recommendation of Railway Board. The DRM is assisted by one or two Additional Divisional Railway Managers (ADRM) in the working of the division. Divisional officers heading all departments viz. engineering, mechanical, electrical, signal and telecommunication, accounts, personnel, operating, commercial, safety, medical, security branches report to the Divisional Railway Manager.